The Chartering of boats is possible for a variety of uses and from a number of locations in the Vendée. It can be for an hour to discover the Green Venice, or Marais Breton, or to go offshore fishing and take in the sights from the sea, or to hire a yacht or a motor boat for serious offshore cruising. In a separate section we deal with the hiring canoes and kayaks as we do with hiring of different types of boats in the Marais poitevin. In this section we deal with the chartering of boats for offshore fishing, for sightseeing (promenade de Mer) and yacht charters. Sight-seeing trips by Boat. As most of the sea fishing trips are conducted in the mornings the same boats undertake sightseeing trips in the afternoon. Also see sea fishing trips. Tél : 0.825.135.500 trips to La Rochelle, Ile d'Aix, Fort Byard, Ile deRe. Fromentine: Compagne Vendéenne, trips to Ile D'Yeu Tel. 08 25 13 90 85. St Gilles-Croix-de-Vie: Compagne Vendéenne, Place de la Douane Tel. 08 25 13 90 85. trips to Ile D'Yeu . Visa Vie. Pont de la Concorde. Tel.06 60 69 80 13 Cruises of the river Vie. Bare Boat Charter: also includes skippered charters, beach Catamarans. Bretignolles-sur-Mer: Ecloe Municipal Normandeliere. Tel.02 51 20 81 45. Beach Cats. Port Bourgenay: Loc Atlantique. Tel. 06 11 29 82 25. Boats with or without Permits. Beach cats and motor boats. yachts with or without skippers. Institut Sports Ocean.1 promenade Kennedy. Tel. 02 51 95 15 66. Beach Cats. Schooner Fillao. Port Olona. Tel 02 51 95 15 66. St.Gilles-Croix-de-Vie: Semvie Nautisme. Boulevade de l'Egalite. Tel. 02 51 60 11 11. Vykra Promocean. Forum Port la Vie. Tel. 02 51 54 30 50. La Faute-sur-Mer: L'Aphrodite. Port des Professionnels. Tel. 06 09 63 39 89. 15th June/15th Sept. 8h - 13h fishing prom. afternoons. 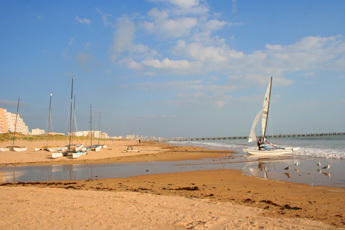 Les Sables d'Olonne: Au Bonheur des Dames. Port Olona Tel.06 18 15 66 00. Morning fishing, afternoon Promenade Schooner Fillao. Port Olona. Tel 02 51 95 15 66. Cata. Les Messalines. Quai Guine. Wooden fishing boat. Tel.02 51 95 27 32. Fishing and promenade. Plus Mer Port Olona Tel. 06 65 50 28 84. St.Gilles-Croix-de-Vie: Mephisto IV 16 Quai de la Republique. Tel. 02 51 49 14 53. Fishing and Promenade. Le Hope. Trad Sail/fishing boat. Tel. 02 51 60 23 93. Le Ami du Peche. 84 Quai de la Republique. Tel. 02 51 55 15 48. Fishing and Promenade. Visa Vie Pont de la Concorde Tel. 06 60 69 80 13. A bord du Roch Melen. Tel 02 51 54 95 73.